Ever wonder what it’s like to drive in style and still get 49 miles per gallon? 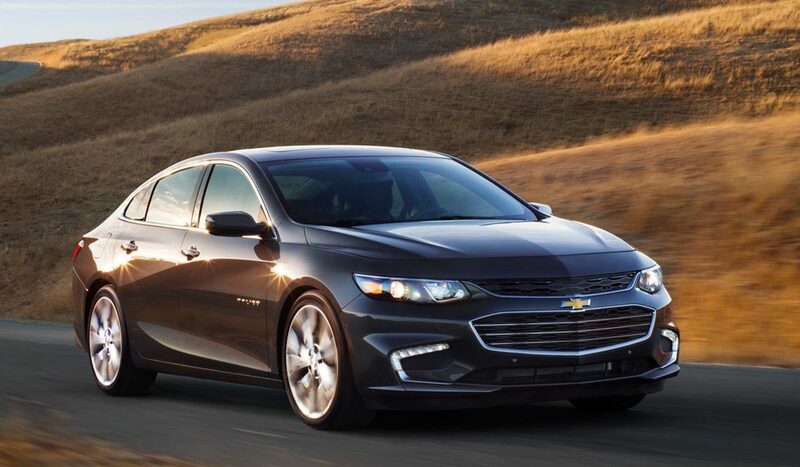 With the Chevrolet Malibu, you can cruise the Toledo area looking great and getting incredible gas mileage! The striking style of the 2018 Chevy malibu is coupled with incredible specs that has earned it the title as 2017 Best Mid-Sized Car for Families by U.S News and World Report for Families. It was also one of the Insurance Institute for Highway Safety’s 2017-2018 Top Safety Pick. Each Malibu has a charismatic look united with an aerodynamic design for the ultimate efficiency. Choose between three engines: 2.0L Turbocharger, 1.5L Turbocharger or a 1.8L Hybrid, then choose your trim! Whichever you choose, L, LS, LT, Hybrid, or Premier, you won’t be disappointed. This car even monitors your driving and reports back to you on how your driving is impacting the environment. The 2018 Malibu comes standard with many OnStar features including: Hands Free Calling, Emergency Services and Roadside Assistance, as well as Vehicle Diagnostics and many others. The Teen Driver technologies are sure to keep your young drivers safe and coach them through their early stages of learning to drive. Teen Driver mutes the music if the front passengers are not wearing their seatbelts and has alerts for lane-changing and side blind spots. The vehicle will run its own report and let you know if any of the safety features were triggered. Other safety features for Teen Driver include Forward Collision Alert and Forward Collision Avoidance Braking. Tired of using all your data up during car rides? Now you can take the internet with you thanks to the 2018 Chevrolet Malibu’s built in 4G LTE Wifi connection! Use your wifi to connect your phone with the myChevrolet app and then you can lock and unlock your doors with a tap of your finger. You can even run diagnostic reports, send directions to your in-car navigation system and set parking reminders. The new Chevy Malibus support Apple CarPlay, Android Auto, and MyLink and are compatible with wireless charging. The wireless charging slot near the front of the center console contains technologies that are compatible with smartphones and abolishes the need for a charging cord. The slot is composed of a rubberized mat similar to those of Apple’s for the new iPhone 8. There’s nothing like personalizing your vehicle and really making it your own. Snyder Auto Group, conveniently located near Toledo makes it easy for you to design your own Malibu. The available options for the 2018 Chevrolet Malibu include 16”, 17” or 18” black or aluminum wheels. If you really want to go all out with customization, check out the Redline series that’s coming out this winter for the Malibu! Previous Redline models feature black grilles, tinted windows, and signature black wheels with red striped accents. If the Redline series isn’t for you, check out all the color options for the Malibu! From Cajun Red, Velvet Blue and Pepperdust all the way to Iridescent Pearl, Mosaic Black and Summit White. Conveniently located near Toledo, Ohio, Snyder Auto Group is here to help you find your perfect Malibu. Having been a Chevrolet dealership for many years, our staff is educated and equipped to answer any questions you may have. Give us a call today at (567) 341- 4132.